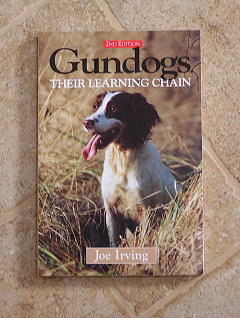 After having read another Joe Irving book a few years ago, I didn't know what to expect with "Gundogs, Their Learning Chain." Perhaps it is because I currently have two one-year-old Springers in the kennel and therefore am attuned to training issues, or perhaps the book is that much better, but Joe has made a believer out of me. Irving calls the sequences of basic lessons a "learning chain." You must build on the first before the next will be effective. For instance, if pup is not consistently retrieving, has the foundation for recall ("come" or "here") been established? If not, go back and work on that before moving on to retrieving. A simple concept indeed, but Irving's insight into the mind of the pup (and the trainer) makes this book especially useful. Irving also stresses the need to make training fun for the pup; you need to make it a "game." Say Irving, "One little game progresses on to the next and they are closely related to each other; if the trainer engages in this regime in a happy relaxed frame of mind, with little thought of failure, then success is virtually assured. "From little acorns great oak trees grow", and so it is with anything - there has to be a beginning. The training of dogs is no exception; you have to start somewhere and then build on it. The 'little acorn' in the training situation is, of course, the 'sit' command, for from this all else grows." As with many books, not all the information is useful to everyone. There is a chapter on "The Pointers and Setters," and also a chapter on "Picking up and Beating." And, as is often the case, the whistle commands differ somewhat from those typically used in American spaniel trials. However, the book has over 200 pages of text, and with a fairly compact font, so there is a lot of information to digest. This is not a book you will devour in a few sittings. Besides the basic information, structured around the "learning chain" paradigm, the book is chock-full of little tricks that come only with years of experience. Those who have been training for a while will probably notice these techniques, and may even learn a thing or two. This has been the most worthwhile training book I have reviewed in quite some time. "I am convinced that there is too much emphasis in gundog training placed on physical chastisement and not enough attention to the prevention of the problem in the first place." Bill Fawcett resides in the Shenandoah Valley of Virginia with his wife, Cindy, and his Smythwicks Springers: Jenna, Beebe, Chip and Dottie. 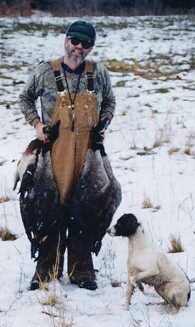 He is a hunter, field trialer, breeder and member of the M-AHSC and the ESSFTA. He maintains a public FB ESS pedigree database at smythwicks.org.